After more than 23 years in office, Tunisia’s President Zine el-Abidine Ben Ali, “Zinochet” as he was dubbed, was forced from power yesterday by popular protests. How could Mr. Bou’aziz know what the implications of his desperate act would be in just one month’s time? His sacrifice inspired huge demonstrations that spread across the North African country, organized in part through resourceful use of Twitter and Facebook. These were met with brutality by the security forces, a grim reality that simply provoked more protest. Unarmed demonstrators were regularly teargassed. Many were arrested. As many as 70-80 people were shot or beaten to death. But the protesters marched on. This largely peaceful, democratic revolution (on the side of the opposition at least) was not led by or inspired by the fundamentalist movements that have tried to claim the oppositional space in many Arab and North African contexts in recent years. It was instead, by all accounts, a largely secular appeal for real political reform and for social justice. As reflected in today's front page of the Paris daily Liberation (above; credit), women, many unveiled, were increasingly visible in the protest marches. 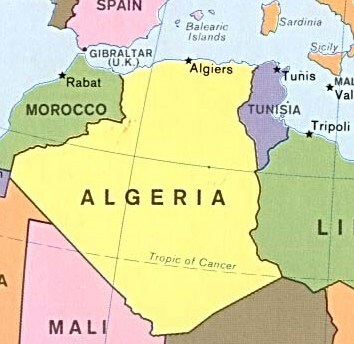 One can hope that today’s initial victory of North African people power will serve as an example of what is possible in other countries in the region. This is what Noam Chomsky has called the threat of a good example. One dictator brought down by popular revolt – no dictator is safe now. Hope is a powerful, incandescent force. Hope in the political realm has been a rare commodity of late in this part of the world. Bou’aziz’s revolution may have brought that back. But, just as the power of hope should not be underestimated, neither should the danger of hopes unfulfilled. It is unclear exactly what the future holds for Tunisia now. Mohammed al-Ghannouchi, the Prime Minister who has also been in power since 1999, has taken over as President since the departure of ousted President Ben Ali, whom Saudi Arabia "'welcomed.'" A state of emergency was declared, with soldiers guarding public buildings, tanks on the streets of Tunis, and prohibitions on public meetings. 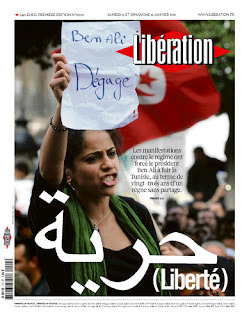 The government must respond to the grievances that first provoked these events – creating jobs, meeting human needs, fostering equality of all kinds, enabling freedom of expression and association, institutionalizing real social democracy – rather than simply engaging in window dressing that preserves the Tunisian system with a different figurehead. The international community, and the U.S. government, should support this process. 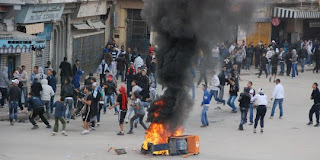 The biggest external impact of events in Tunisia could come in neighboring Algeria, which I visited twice last fall, and which witnessed scattered, sporadic émeutes – riots – throughout 2010. The country has just experienced a week of widespread, intensive youth protests that seem to have been the result of a similar long-simmering anger over high unemployment, corruption, economic disparities and la hogra, the arrogance with which officials often treat ordinary people. (photo credit) However, the immediate catalyst was likely the sharp increase in the price of staples like cooking oil and sugar at the beginning of the year. See this useful discussion of the possible causes by journalist Chawki Amari writing in El Watan, one of Algeria’s leading daily newspapers. Some have suggested that the initial disturbances may have been provoked – perhaps by private interests that control the sugar and oil markets and were unhappy over government regulatory action in this arena. It is hard to say. However, even if this were the case, legitimate popular anger clearly took over from there. Some - only some - of the recent protests turned violent with young rioters throwing stones at police and passing cars, burning tires and looting shops. Unfortunately, the avenues for peaceful protest are stifled in Algeria due to the continuing imposition of a state of emergency since 1992. In fact, the Algerian government now uses the state of emergency to justify the banning of public gatherings of all kinds. For example, when I visited Algiers in late November to attend a meeting on a proposed draft law on violence against women, the meeting was declared officially non-authorized the day before it was to take place in the central Hotel Safir. Hence, it was held quietly instead in a small room at a more remote location, with many participants unable to attend. It is shocking that a meeting of women working to stop violence against women requires an official permit. Who exactly is being protected by “emergency” legislation in this scenario? Some believe that it may be difficult to make a real political transformation as long as Algeria’s government possesses the significant material resources it uses to selectively placate sectors of the population. 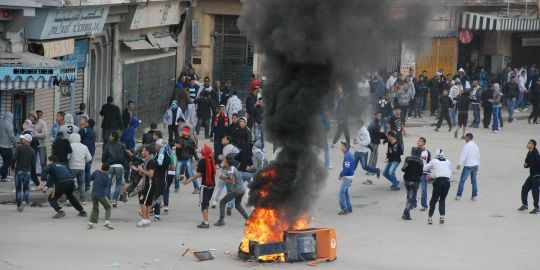 But attempts to publicly speak out for change continue, as witnessed by a peaceful youth demonstration today in Algiers. And it remains to be seen what the impact of the winds blowing from Tunisia now will be. While in life Mr. Bou’aziz was given little opportunity to have an impact on society, in death he may have helped to change not only his own country, but the entire region. Timely, informative...excellent post! Thanks so much. thanks for putting informative details about this revolution and region. Lets hope great people of tunisia would be able to enjoy the freedom of secular democracy. Hijacking of revolutions in this region is usual thing. Some have hijacked revolution using religion and others used hate sentiment in muslim world against the west.